Meet the superpowered nonagenarian who is still donning the tights and fighting (or committing) crime. Now spin your own story about this spandex-clad lady. Is she a hero? A villain? Or simply a woman with excellent fashion sense? We've featured Sacha Goldberger's Mamika series in the past, and it comes with a really sweet backstory. Goldberger felt that his grandmother, who hid Jewish people from the Nazis during WWII, was lonely and depressed, so he started photographing her as a superhero. 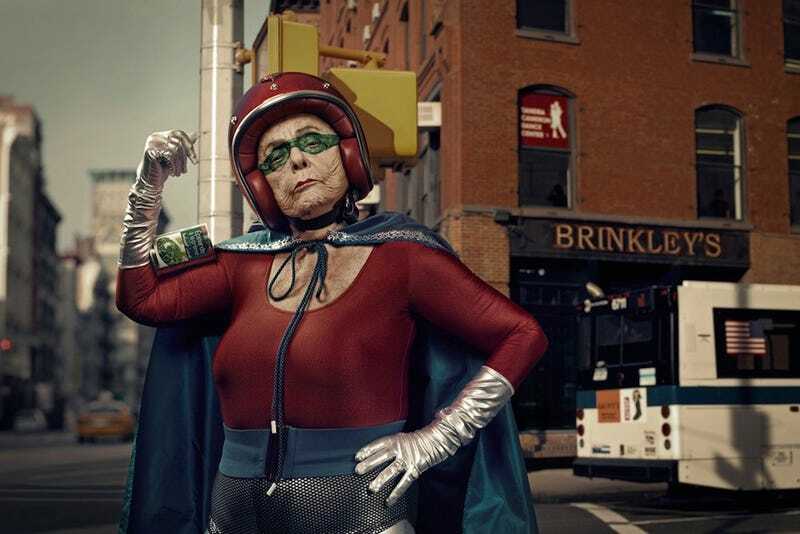 Now Mamika (Hungarian for "grandmother") is a frequent subject of his photographs, and she was much cheered by this superhero series. As always, we ask you to come up with your own story based on this photo and post it in the comments. Is Mamika still in action? Does she inhabit a Welcome to Tranquility-style retirement community? And does she have children or grandchildren trying to live up to her legacy? Hector's mother always joked that his grandmother's only superpower was guilt, that she convinced Ruddy Robert and Eva Destruction and all the rest to lay down their arms by telling them she was terribly disappointed in them. But Hector had seen Mamika on the television, zooming around the New York City skyscrapers and pummeling monsters with her tiny, wrinkled fists. She'd brought him rocks from Mars and candies cooled in the ices of Europa. So when Hector and his mother fought about him trying out for football (she refused to sign the permission slip, and he nearly broke his toe trying to kick down the front door), he ran away to the house of the coolest person he knew: Mamika. He took three buses and a subway before knocking on her apartment door. She smiled as she opened the door, but her brow quickly furrowed. "Were you supposed to be visiting?" She scratched the side of her face, trying to drum up the memory. Hector had seen her out of costume before, at family dinners and on holidays when she came to visit. But she looked different somehow, her eyes wider beneath the cat-eyed eyeliner and her lips glossier. She wore a gold beaded dress that beamed rainbows across the room. He told her about the fight, about how his mother was always worried he'd get hurt. "After I broke my collarbone, she had the tree in our backyard cut down." "Helicopter parenting," Mamika sighed. "You didn't see me doing that, and I could fly like a real helicopter." She poked her fingers into Hector's stomach and tickled him. He giggled. "You stay here as long as you like," she said. "We'll figure something out with your mom. Kids have got to grow up with a little freedom." She looked at her watched and swatted her own wrist. "Well, got to go. Grandma's got an appointment. You'll be okay here by yourself?" She grinned at him and tweaked his nose. "Of course you will. My big man." After Mamika left, Hector inspected the photos covering every wall and side table in her apartment. She had photos of herself with all the greats: Captain Lincoln, Sin Dixie, even Uber-Rube during the brief period when he'd been President of the United States. But there was something strange about those photos, something he couldn't quite put his finger on. It wasn't until dawn was peeking through the guest bedroom windows, with no sign of Mamika's return, that it finally hit Hector: there wasn't a single photo in the whole apartment of his mother.